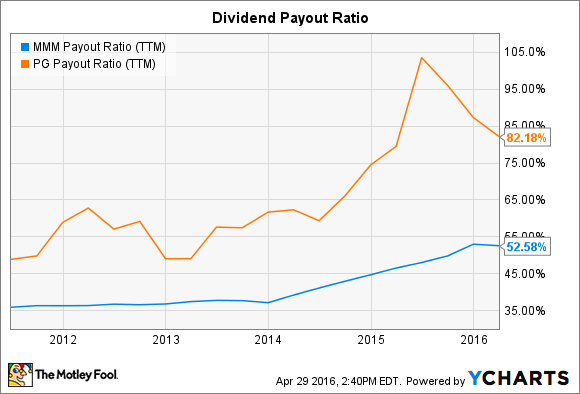 We're stacking the two dividend aristocrats against each other to see which one makes the better bet for income investors. Dow giants 3M (NYSE:MMM) and Procter & Gamble (NYSE:PG) boast two of the biggest, longest-running dividend payment histories in the stock market. In fact, it's been about 60 years since shareholders of either stock have missed a payout raise, and between them, the companies send over $10 billion to investors -- every year. However, there are key differences income investors will want to keep in mind when deciding between one or the other of these dividend aristocrats. Read on for the details, but the bottom line is that 3M's payout looks like it has much more room to grow from here. 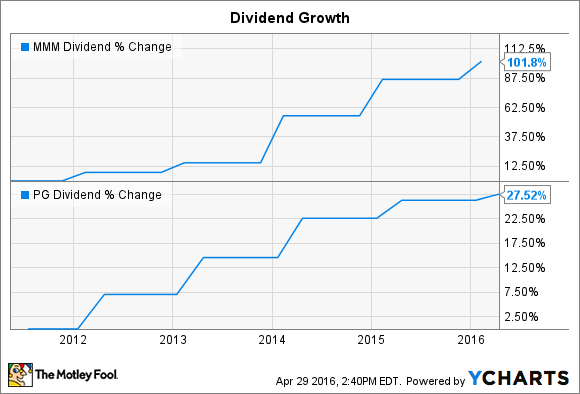 3M's latest 8% dividend raise followed a 20% spike in 2015. In contrast, consumer goods specialist P&G just gave its shareholders the smallest dividend boost in memory: 1%, following a mere 3% increase the prior year. There's a good reason for those different growth trends: earnings. P&G's reported profits sank by almost 40% last year and are on pace to fall by 5% in the fiscal year that ends in August. Sure, much of that drop can be tied to foreign currency swings, but 3M's global business has performed better through similar tailwinds. Its earnings were flat last year even as stock buybacks helped boost EPS to $7.72 per share, up from $7.63 per share in 2014. MMM Payout Ratio (TTM) data by YCharts. P&G's payout ratio, or the percentage of earnings dedicated to dividend payments, crossed 100% last year and only recently started moving back down toward a more manageable level. The payout ratio should improve to about 70% in fiscal 2016, executives say, but that's still well above 3M's 54% rate. Looking forward, both companies see a sluggish global selling environment ahead. 3M has forecast organic sales growth of between 1% and 3% this year, while P&G is on track to roughly match its 1% uptick from last year. Both giants plan to cut costs and push operating margins higher while focusing on improving on their already stellar cash-generation abilities. However, P&G is in the middle of a huge strategic shift that, while pressuring results right now, could produce a bigger total payoff to long-term investors. It has sold off dozens of its brands with the aim of raising its overall growth rate and profitability while making it an easier enterprise to manage. These divestments have accelerated the sales and profit slide and made it more likely that the dividend won't be growing quickly over the next few fiscal years. Still, P&G's brand sales, along with aggressive cost cuts, have raised billions of dollars that the company plans to deliver back to shareholders between now and the end of fiscal 2019. Its total cash returns are increasing to an $18 billion annual pace from $12 billion over the past few years. 3M returns cash at about an $8 billion annual pace. Income investors might still likely prefer 3M's shares today. At a 22 P/E ratio, they are valued at a discount to P&G's 25 ratio. And the fast-climbing profits point to bigger payout hikes over the next few years. Those benefits seem good enough to make 3M the better dividend buy, even though its yield is substantially lower than P&G's right now.